HELSINKI (BRAIN) — Amer Sports says its Mavic cycling business is "under review" as Amer updates its strategy and looks to focus its portfolio of brands, which includes Salomon, Arc'teryx, Peak Performance, Atomic, Mavic, Enve, Suunto, Wilson and Precor. COLORADO SPRINGS, Colo. (BRAIN) — Apache Bicycles, a 17-year-old bike brand based in the Czech Republic, is planning some changes to its marketing, which outraged many on social media in recent weeks. SCOTTS VALLEY, Calif. (BRAIN) — "The system is complex, but what you get is simple," Fox says in its marketing. But how hard is it for dealers to set-up, tune and service the complex system? Limited numbers of bikes with the new $2,000 upgrade are hitting the market, allowing Fox and bike brands to educate retailers on it. BANGKOK, Thailand (BRAIN) — Vee Rubber Corporation, the parent of Vee Tire Company, is adding staff and expanding capacity at its Thailand factories as U.S. brands look for alternatives to Chinese production. BOULDER, Colo. (BRAIN) — Charlie Cooper has left PeopleForBikes, where he had been vice president of membership and development since 2014. WASHINGTON (BRAIN) — More bike industry members plan to tell a multi-agency committee that proposed tariffs will harm the industry and consumers and not achieve the adminstration's stated goals. As e-bike tariffs take effect and low-level negotiations resume, more bike industry executives speak in Washington. PARSIPPANY, N.J. (BRAIN) — Kent International's project to bring back the iconic Univega bicycle brand is continuing to progress. 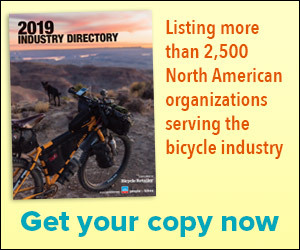 The company will show its new product line at Interbike next month and already has more than half the country covered by a sales rep force, company officials told BRAIN. Company hopes to have juvenile bikes ready in time for the holiday season.